Organizing a woodshop can be challenging. The objective is to create an environment that produces the highest quality work in the most efficient manner. That requires a good layout, well-designed traffic routes, superior lighting and, of course, ways to manage both materials handling and storage. Plus, a good shop caters to its inhabitants, both human and arboreal, by addressing heat, cooling and humidity levels. Layout comes down to lining up the production process in an orderly fashion. A custom shop by its very nature cannot conform to production line tenets because we rarely build exactly the same thing more than once. Even kitchen builders experience this: although the boxes might be standard sizes, the door styles, finishes and species all change on every job. We don’t repeat products, but we do repeat processes (ripping, crosscutting, sanding, shaping) and that’s the key to a good layout. 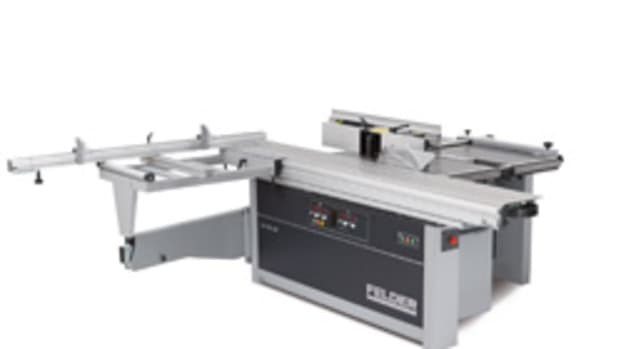 If the shop is long and skinny, the raw material (sheet goods and solid stock) might begin the journey at one end of the space and culminate in the detail work (finishing and hardware) at the other end. In a square shop, the workstations might perhaps be arranged in a logical sequence to start just right of the door, follow the walls around and then end just left of the door. That’s a good theory, but the problem in established shops is the cattle path concept. In medieval Europe, towns grew up around markets and the streets eventually conformed to the natural paths that animals would follow rather than to the Roman notion of cities laid out upon a grid. This happened in America, too. The earliest settlements in New England have lots of winding roads, while streets and avenues in the Midwest tend to follow lines of longitude and latitude. Most woodshops began small, with the owner and maybe just one or two hired hands on board. As machines and people were added through the years, they were squeezed into available space and quite often the infrastructure (dust collection, wiring, lighting etc.) was forced to conform. Now, things are so set in place that ripping everything apart and setting it up in the most logical, sequential way would be as daunting a task as straightening the streets of Boston. The answer lies in compromise. If, indeed, an answer is even needed: many custom shops thrive in their cattle path warrens, running like well-oiled machines. 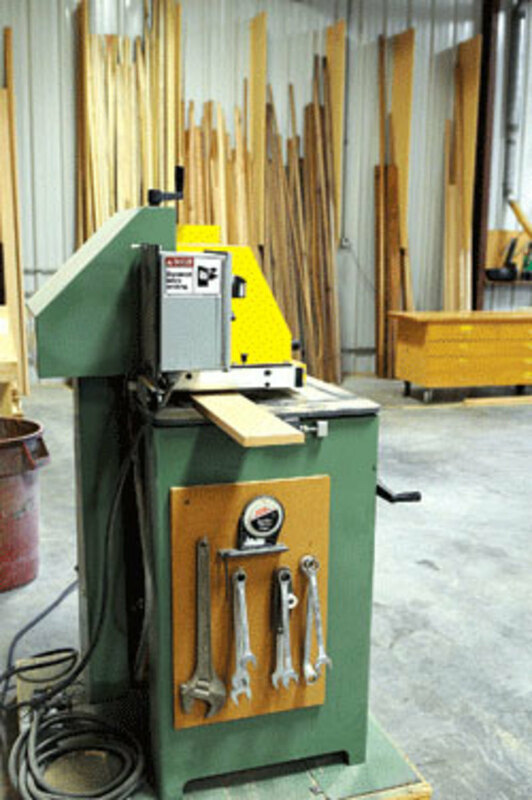 But for most of us in this new, post-recession market, when years of austerity have melted the fat from our bottom lines, woodshops need to be efficient to survive. Margins are smaller now than they have been in a long time and saving steps can mean the difference between just making it and thriving. One way to introduce some efficiency is by establishing traffic routes. There should be clear arteries running through the shop, marked with tape or paint on the floor, where absolutely nothing is allowed to block the road. The swift and easy flow of materials is crucial to improving the pace of production. 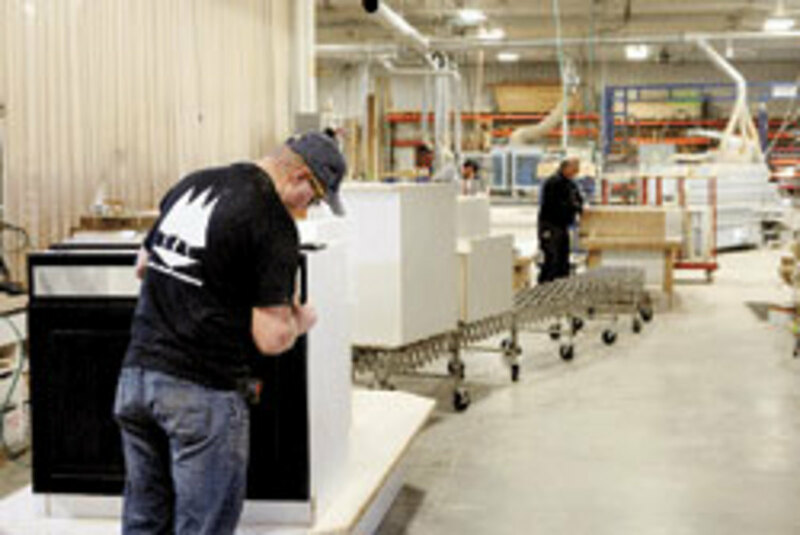 Investing in a few more shop carts can facilitate productivity by bringing work as close as possible to the machine. Opening roads through the shop is also a gentle way to encourage people to do maintenance: if the main thoroughfares are organized well, individual workstations will soon follow. It’s human nature to complete tasks and, when most of the shop looks professional, it’s difficult to stand in a small mess and ignore what’s happening around you. 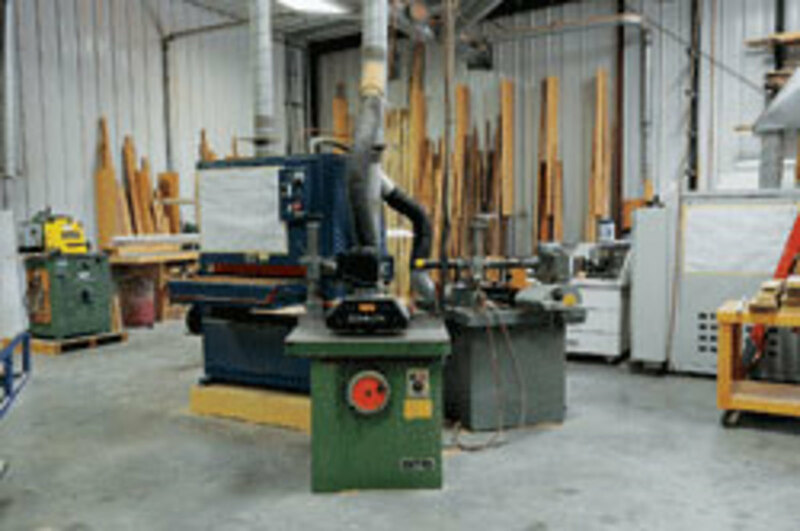 Established roads are also conducive to a fire-escape plan, which a woodshop must have. Lighting also helps to keep things organized. One can’t hide things in dark corners if there aren’t any. 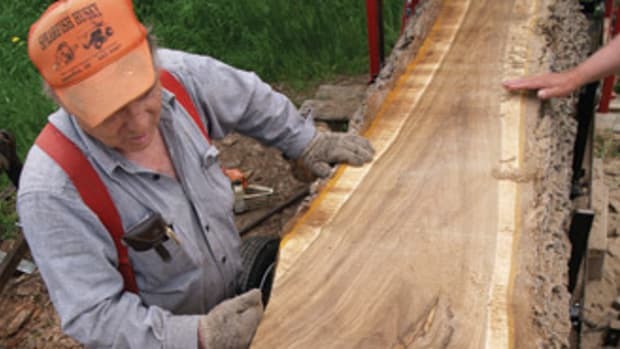 Every woodworker knows that the quality of his/her work is directly related to the amount of light being shone upon it, especially during sanding and finishing. But the same is true in a more general sense of the entire workshop environment. The brighter it is, the more people will want to keep it clean and well-organized. There are no universal solutions when it comes to choosing light fixtures. 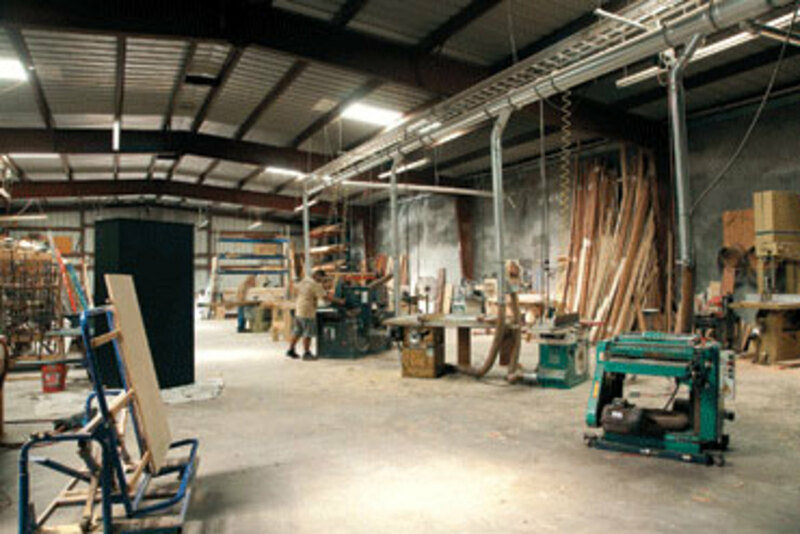 A good place to start is to have a lighting expert visit the woodshop and walk through options such as fluorescent, high-pressure sodium, LED and metal halide. 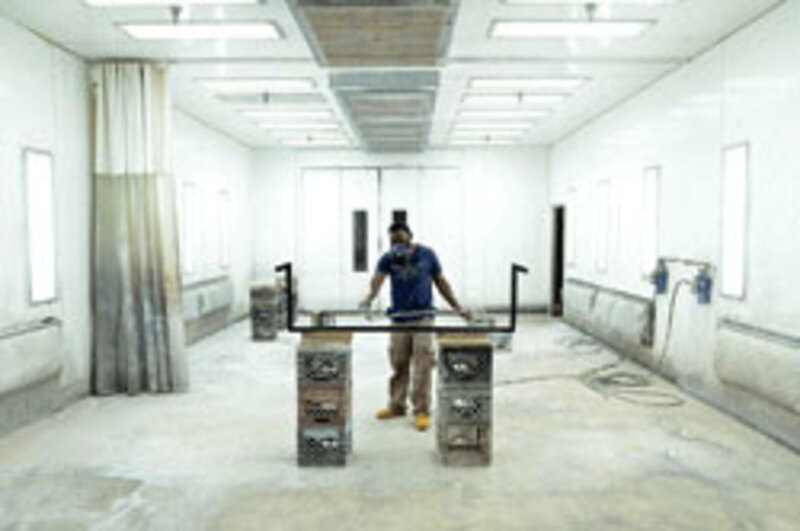 Color is important, and more so in finishing areas than in machining or assembly stations. The color of visible light is measured in terms of temperature on the Kelvin scale (which was named after an Irish engineer who lived in Victorian Glasgow). In theory, the closer one can come to white daylight (about 5,500K), the less effect an artificial light will have on how we perceive color (such as stains, dyes and unfinished heartwood. That range is probably a good goal for task lighting. The lower (warmer) that one goes on the Kelvin scale, the more yellow and red the light becomes. The higher one goes, the more blue/white. Unfortunately, we live in a diverse world. The location where a job will finish up is a factor. The same cabinet will look a bit different if it is moved from a residential kitchen with tan walls and a mix of incandescent and halogen lighting to a bank lobby with mahogany paneled walls and fluorescent fixtures or a retail space with white walls and high-mounted sodium lights. That can sometimes create a small challenge when matching stains and topcoats to existing finishes. One solution is to have one of each type of light available in the finishing room. 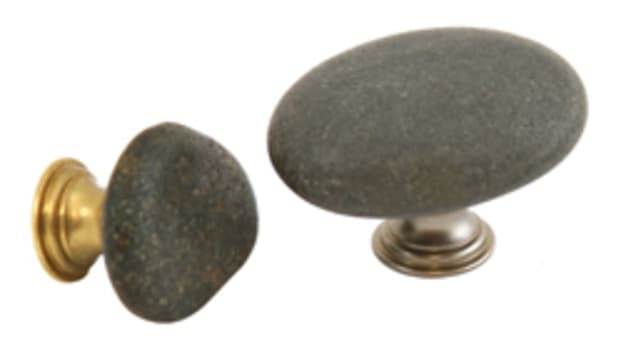 Speaking of that, a portable light is essential in sanding and finishing, because it can be moved to rake – that is, shine across the surface to create tiny shadows where imperfections lie. The bottom line is that a lighting expert can walk through the shop, suggest which fixtures are adequate and educate us on options for improving the quality and quantity of lighting at every stage of the production process. Investing in better lighting is one of those rare improvements that doesn’t have to cost a lot, but can dramatically improve the quality of work. Organizing is what you do before you do something. And nowhere in the woodshop is that more true than in handling and storing materials. 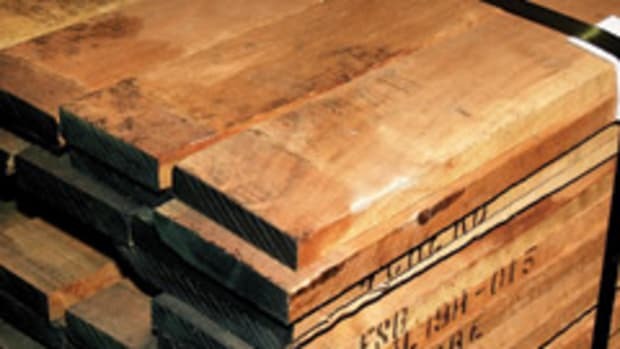 Having hardwoods and sheet goods sorted by species, cut, substrate and thickness makes them more easily accessible, avoids waste, improves the ordering and inventory processes and can even have an effect on sales: if you’ve got three bunks of hickory gathering dust, perhaps it’s time to sell hickory kitchens. There is a lot of common sense in the old adage: keep like things together. But what exactly makes things alike? 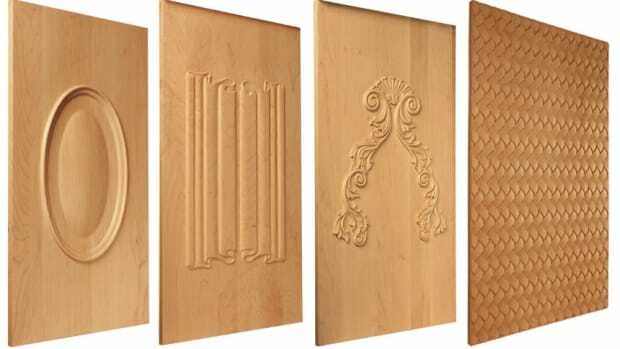 Do we put all of the oak plywood – full and partial sheets – together? Or do we stack all the full sheets in one place and the partials in another? Do we keep all of the birch ply in one bin and the walnut in another? Or do we keep all the 1/2” stock together, regardless of species? 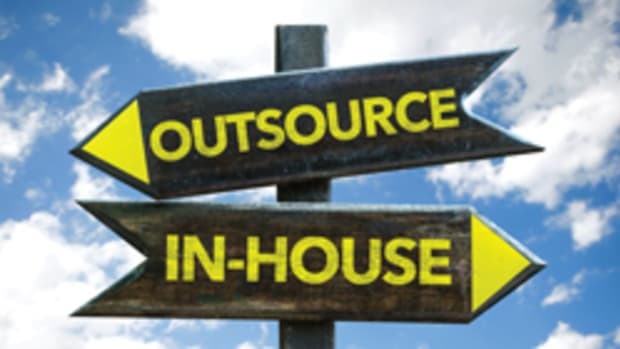 As every shop is different, the answer is probably to canvass the people handling these materials, elicit their opinions and make an informed decision based on consensus. The bigger challenge is to ensure that everyone sticks to the same policy or pretty soon the storage area will look like a library where the patrons are asked to return books to the shelves themselves. 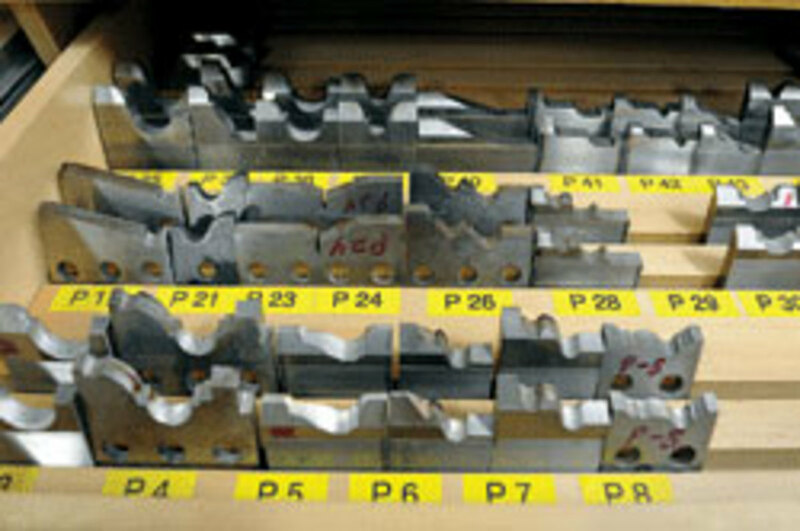 One small investment that a shop might consider is a barcode inventory system. This is simply a database on the office computer and a handheld wand that reads code from stickers and adjusts the records accordingly. 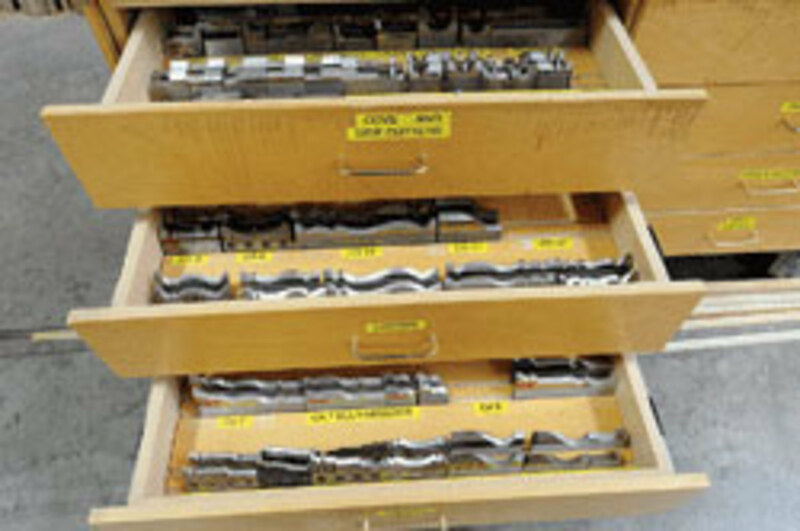 Such a system can keep track of all the materials - and even the supplies – in the shop, from gallons of lacquer to drawer slides to sandpaper. 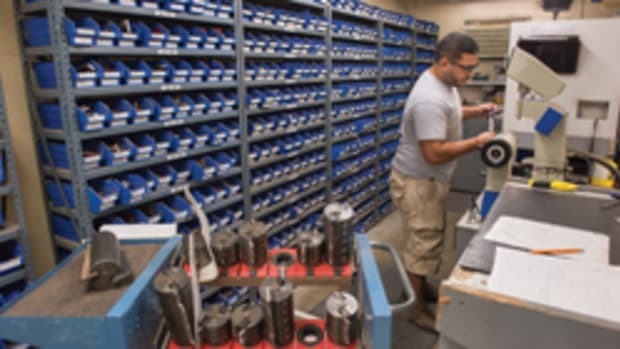 It’s accurate (although still subject to the “garbage in, garbage out” rule), provides the shop manager with instant on-hand quantities and can physically find everything in the shop as long as items have been assigned a shelf, cabinet or bin location. Most of the products we use already come with barcode stickers attached and printing the rest in house for individual items (such as sheets in a flitch or boards in a bunk) is relatively simple. 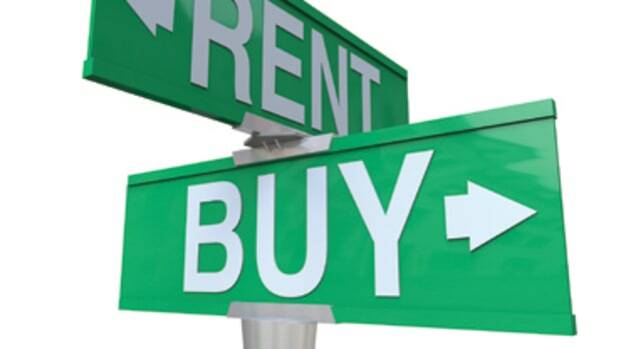 Such systems can be quite inexpensive (under $1,000) and they begin to pay for themselves on Day One. Just remember to train two people to use it, so that the place doesn’t grind to a halt if one guy gets the flu. 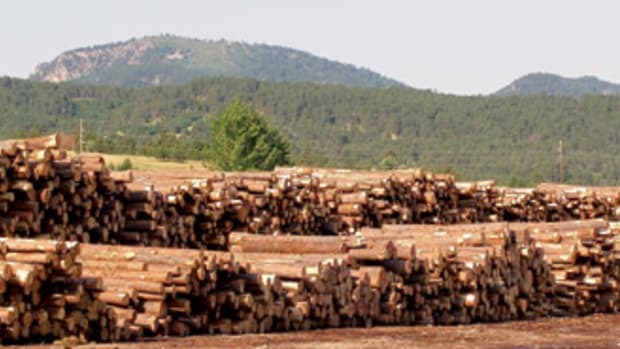 Can it pay to mill your own lumber? They trickle through the mail every few months: glossy brochures for portable saw mills that leave a woodworker wondering. Ironically, the appeal of harvesting one’s own lumber has little to do with economics.